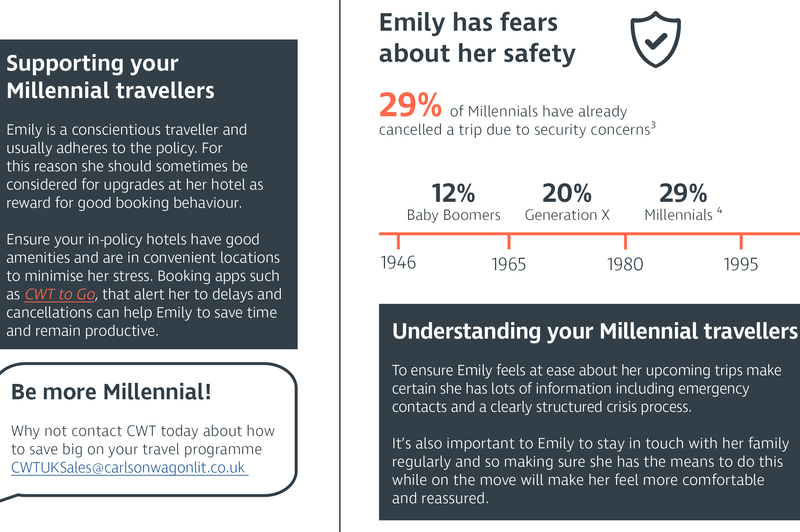 Current generation are concerned about safety and more likely to cancel a business trip due to security concerns, CWT research says. 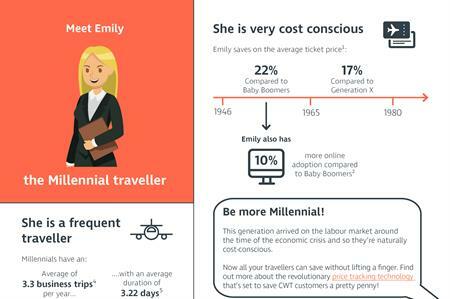 A generational shift means Millennials will form the largest group of travellers in a company, according to research from CWT Solutions Group – the consulting division of Carlson Wagonlit Travel. The 2017 CWT Connected Traveller Study examines the behaviour of its business travellers to find out what impact this generation is having on travel programmes. The result is ‘Emily,’ the average Millennial traveller, who can be found in almost every business. CWT’s UK&I country director Johan Wilson said: "Looking at the different generations provides important insights into how travellers differ and what their needs are. "With a specific persona like Emily in mind, travel managers can look at the individual groups and implement measures for their travel programmes." One of the key findings that came from the research was that Emily has greater fears about her safety than her colleagues. 29% of Millennials have already cancelled a trip due to security concerns - compared to 20% of Generation X and 12% of Baby Boomers. Therefore, event planners and travel managers should make extra efforts to try and ensure the younger generation feel more at ease when travelling. Emily was born after 1980, makes 3.3 business trips per year and travels an average of 3.22 days per trip -almost half a day longer than the average of all travellers. Having entered the labour market immediately after the economic crisis, she is very cost-conscious and manages to keep her travel costs down compared to her Baby Boomer or Generation X colleagues. She saves almost 25% on the average ticket price compared to Baby Boomers and 17% compared to Generation X.
Millennials are also doing better on other corporate performance indicators, such as online bookings (+10% compared to Baby Boomers) and travel policy compliance, the report found. For more features and breaking news, sign up to C&IT's daily Newstracker. How do millennials see the future of flying?